Happy Valentine’s Day! Storytime falls midweek so we celebrated a bit early at storytime. Generally speaking, I don’t like Valentine’s Day books for storytime because they are long, a bit too sweet and just not great to read to a group. So, instead I went with an “I Love You” theme today. There are TONS of books about love and this is a concept preschoolers are familiar with. We started with The Cuddle Book by Guido van Genechten. My group was very active and talkative today. They had a lot to tell me since we missed storytime last week due to the blizzard. I was a bit unsure about how well this book would captivate them and it turns out I had nothing to worry about. This is a very nice book about cuddling. Each spread shows different animals and how they cuddle. “For crabs, cuddling is hard.” Very cute. Next we read How Do Dinosaurs Say I Love You by Jane Yolen and Mark Teague. I am constantly singing the praises of the dinosaur books by Yolen and Teague. I really love these books and think they are great to share with a crowd. I have read discussed two titles previously: How Do Dinosaurs Say Goodnight? (here) and How Do Dinosaurs Eat Their Food? (here). How Do Dinosaurs Say I Love You does not disappoint. What I like about this book is it is very reaffirming about love, even when the dinosaur does something naughty, the parents still love him or her. We closed with My Heart Is Like A Zoo by Michael Hall. This is a great rhyming book featuring animals made out of heart shapes. It’s super simple but very nice to read a loud. 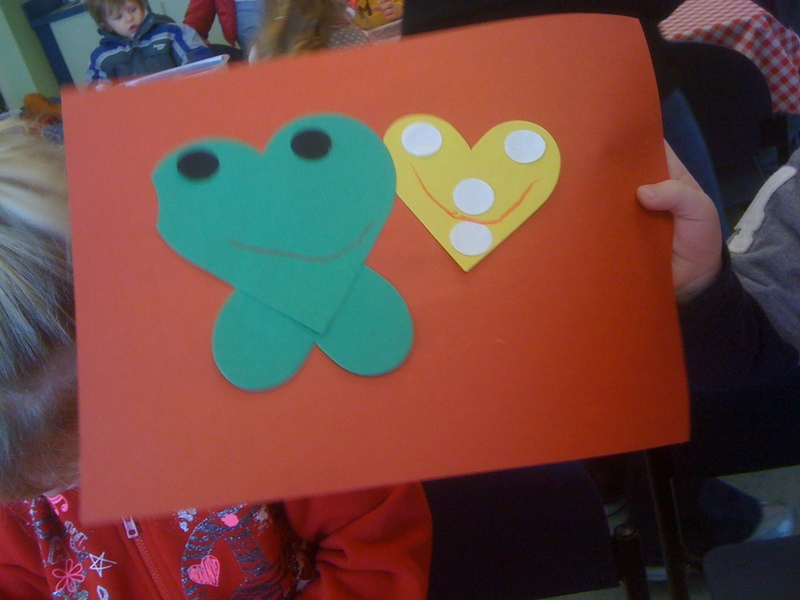 The kids really enjoyed it and especially enjoyed the frog- everyone spontaneously started hopping like frogs! Moments like these are the best part of storytime. This is a great book and it was the perfect tie-in for our craft. We made heart animals. This consisted of different sized hearts cut with the die cut machine, crayons and a whole lot of imagination! How cute is this butterfly? I don’t know if youc an tell, but my favorite part is it’s face! She was very proud of her work. Lots of beautiful hearts! Very nice! I would like to add that they decided to match the colors together, I didn’t think that would happen but they did it on their own. My most favorite holiday ever is Halloween! Last year we sort of dropped the ball with our Halloween storytime so I definitely wanted to make up for it this year! My theme was loosely ghosts. I had one book, in particular, that I was excited to read and sort of used as inspiration for this week’s storytime. We started storytime this week with Pumply, Dumply Pumpkin by Mary Serfozo. I think I have pulled this book before for other storytimes but it hasn’t made the cut for storytime. I really liked this book. It was fun to read with lots of rhyming phrases and the kids really enjoyed guessing what the pumply dumply pumpkin would be used for. Next we read Boo, Bunny! by Kathryn O. Galbraith, illustrated by Jeff Mack. This book is a good example of me really liking a book and realizing that it may be better for a lapsit type of situation rather than a storytime after the fact. Don’t get me wrong, I think the kids enjoyed it… just maybe not as much as I thought they would. Before I started the story one little girl asked if this was a scary story. I told her it wasn’t scary but it was maybe a little Halloween creepy. I think that a) my answer didn’t really make sense and b) the kids were a little off because of the possibility of it being scary. I think this is a great book and is lots of fun but it wasn’t right for this group today. That happens, I can’t always be super awesome and pick out crowd pleasers 100% of the time. Next we read Go Away Big Green Monster! by Ed Emberley. This book is a classic and really needs no explanation. Emberley’s books are great for storytime because they are so visually appealing. I love it when I read it to a group of kids and there is one in the group who has never seen it before. I love the look they get as the monster slowly starts to unravel. 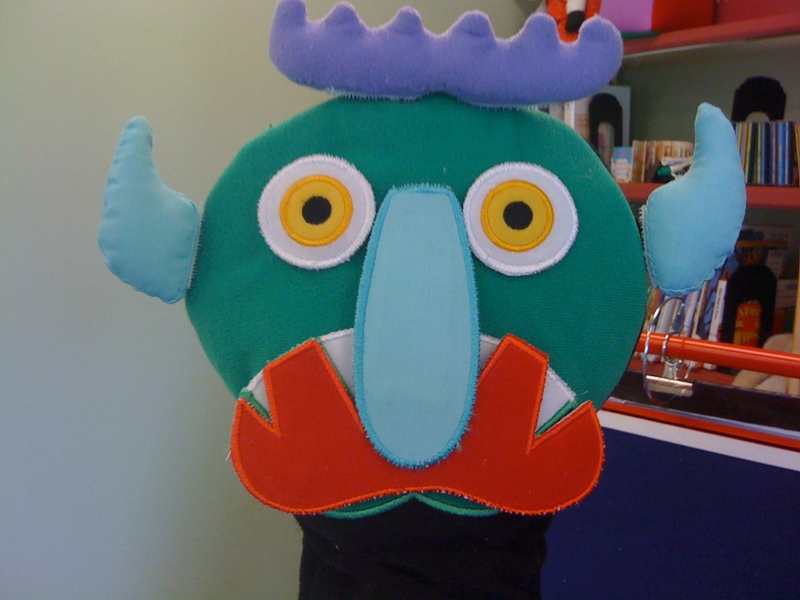 At my library, we have a cool Go Away Big Green Monster glove that I retold the story with after I read the book. The kids really liked the repetition of the story. They also thought the glove was really cool and enjoyed watching me add and subtract its pieces. There are so many Halloween songs and fingerplays out there. I chose just a few to get us rolling…. first we sang If You’re a Ghost and You Know It, which was a huge success. We sing If You’re Happy and You Know It every storytime, so the kids really like it when we mix it up. They came up with lots of great things such as yelling “Boo!”, waving our arms and spinning in circles. The craft today was SUPER easy but also lots of fun. 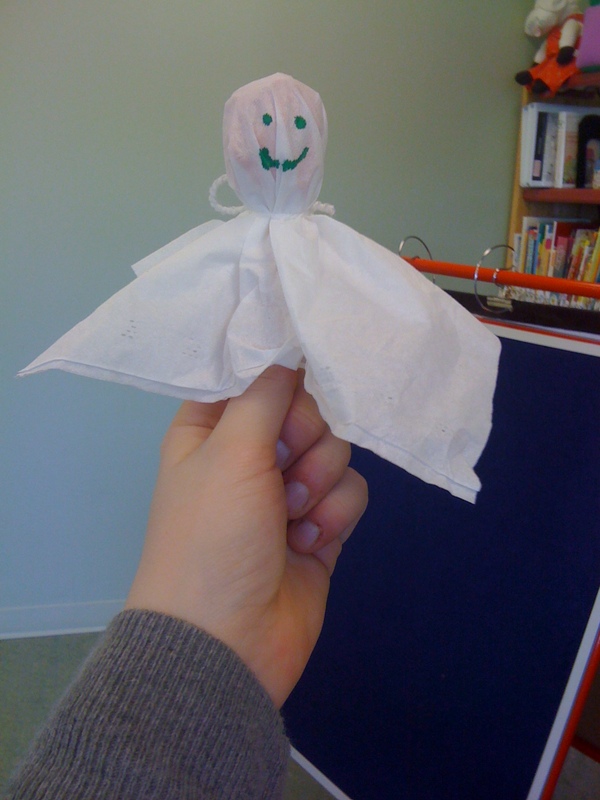 We made tissue ghosts. This is very easy. Using a facial tissue, you cover a sucker and secure it with yarn, string or ribbon. Because this was so easy and quick, I also provided cute Halloween coloring sheets for them to color. Lots of fun! Very rarely does storytime actually fall directly on a holiday. 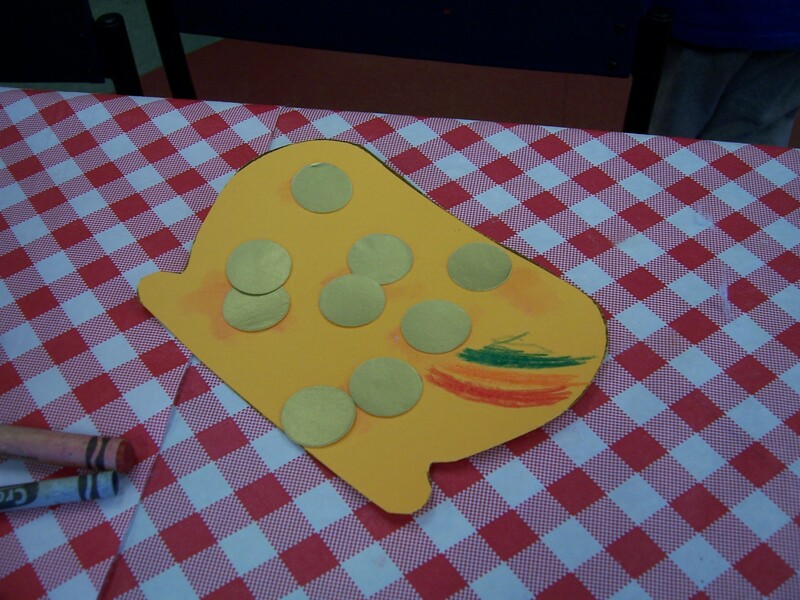 This week was different and storytime was on St. Patrick’s Day! I didn’t feel like I could ignore the holiday so we went all out with a St. Patty’s day theme! The first thing I will say about this theme is it is really easy to find a craft for this theme. There are tons of leprechaun, rainbow, and pot of gold craft ideas out there ripe for the taking. The second thing I will note is that the St. Patrick’s Day books that are around don’t always make the best books for storytime. Sure, there are tons of books about the green holiday but many of them are a bit wordy, lacking bold pictures and just not quite what I look for when choosing a book for storytime for my 3-5 year olds. This week I was able to find two books that suited my needs. I am sure there are lots of other great books out there for this theme, but it was hard to get them because many were checked out for the holiday. Ok, enough of me….. on to the books!!! The first book we read this week was It’s St. Patrick’s Day by Rebecca Gomez, illustrated by Mary Morgan. Initially, I had some reservations about this book. It is an easy reader so it’s small size could have made it hard sell in storytime. Luckily, it has some awesome rhymes so that held the kid’s attention. The next book we read was not about St. Patrick’s Day but is about a green creature. It was Big Frog Can’t Fit In by Mo Willems. I love Mo Willems. I think every children’s librarian loves Mo Willems. This book is just awesome- that’s the only way to describe it. Reading pop-up books in storytime is a great way to pull the group back together because they are so fun to look at. This one is extra special because it is a pop-OUT book that is lots of fun. We finished with The Luckiest St. Patrick’s Day Ever by Teddy Slater, illustrated by Ethan Long. This was a great closer. It’s got great illustrations and also rhymes. The kids were really into the rhyming today so that made it even more fun. While we are on the subject I just want to take a moment to talk about how great the kids were today. We had been on a break so I wasn’t sure how many kids would show up. All of my regulars came as well as some new faces. They were all so happy to be there and some were even dressed up for St. Patrick’s Day. It really is days like this I feel so lucky to have the best job in the whole world. If you are someone who works with children, you will know what I mean. Storytime is one of my most favorite parts of my job and I know how blessed I am to get to do it. 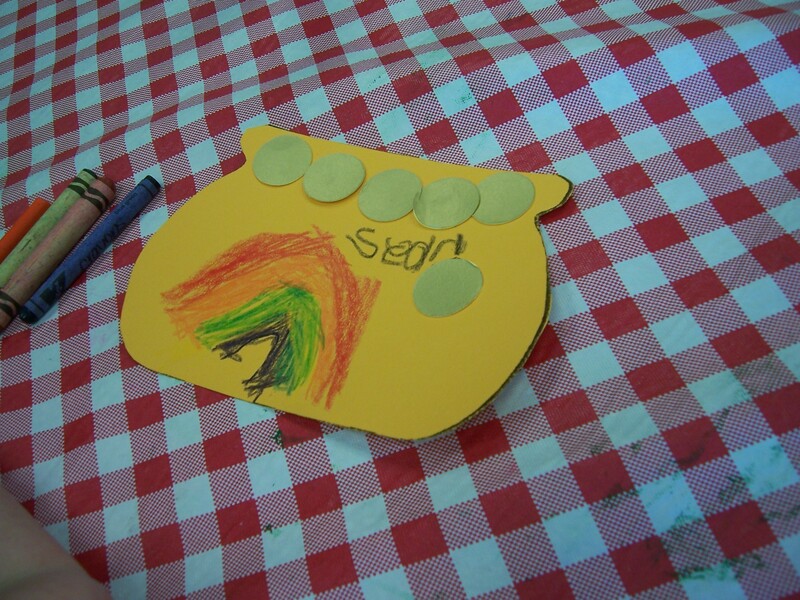 For our craft this week we made pots of gold. The template for the pot is here, from DLTK’s crafts for kids. 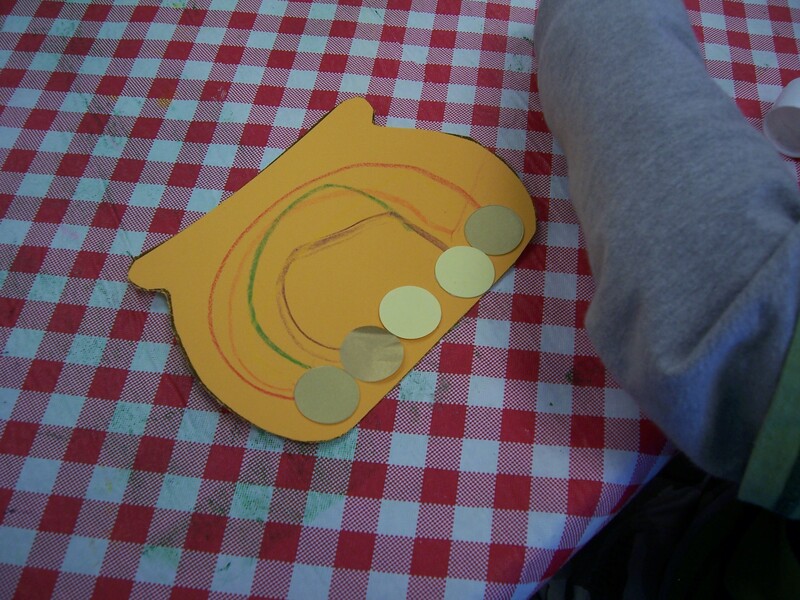 To make the gold pieces, I glued gold tissue paper on card stock and cut out the circles with our die cut machine. They turned out really nice. 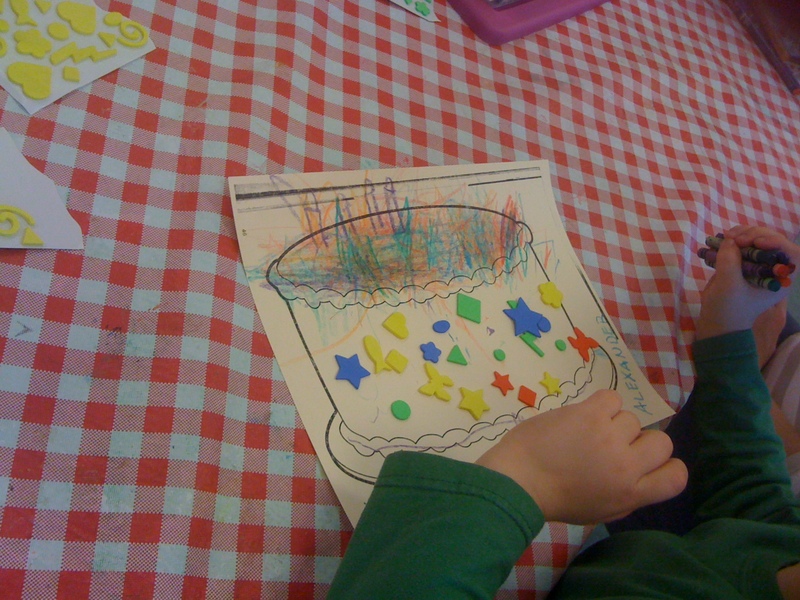 The thing that impressed me most is that the kids decided to draw their own rainbows on all on their own. I didn’t even mention it. They were all fantastic. I wish I could have taken a picture of everyones! I could not ignore the holiday coming up this weekend, so this week’s theme was Valentine’s Day! We began by reading Sweet Hearts byJan Carr, illustrated by Dorothy Donohue. This is a very sweet story about a little panda girl who leaves valentines all over her house for her family to find. This is a very nice book, although the children had a hard time understanding what was going on. I thought it was going to be a bigger hit but sadly, it wasn’t. Next we read I love you Stinky Face written by Lisa McCourt and illustrated by Cyd Moore. This is a great book about a child whose mother reassures him that they will love them even if they are stinky, slimy or even an alien. This book was fun to read and the kids enjoyed it too. After that we read Valentine Surprise by Corinne Demas, illustrated by R.W. Alley. In this book, a little girl tries to make her mom the perfect heart-shaped valentine for Valentine’s Day but keeps making mistakes. Not to worry- her mom thinks they are perfect. This was a great book to read in preparation for our craft today. We finished with Guess How Much I Love You written by Sam McBratney and illustrated by Anita Jeram. I actually hadn’t planned on reading this book but I had brought it with me as a plan B book, just in case one of my other choices didn’t work out, and one of the kids saw it and begged me to read it. It went over really well, I imagine because so many of them were familiar with it. 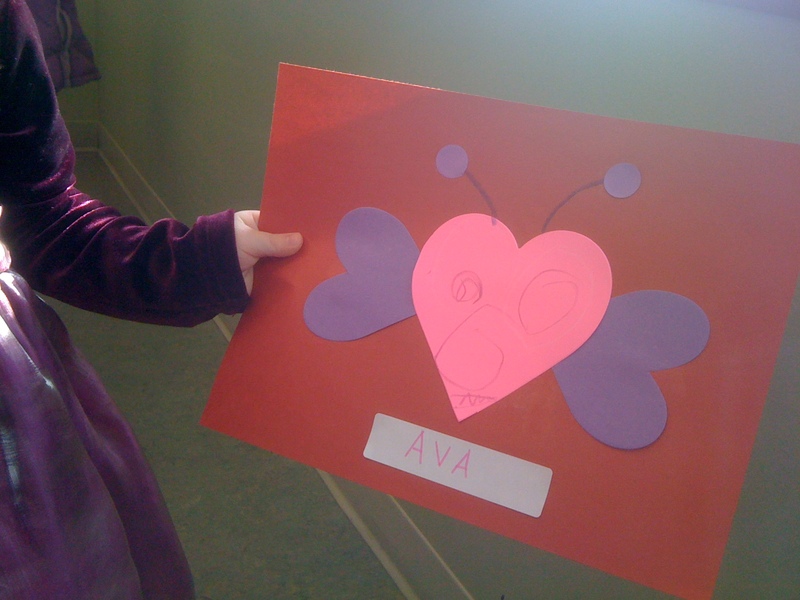 For our craft this week, we made valentines. This was a very easy and super fun craft. 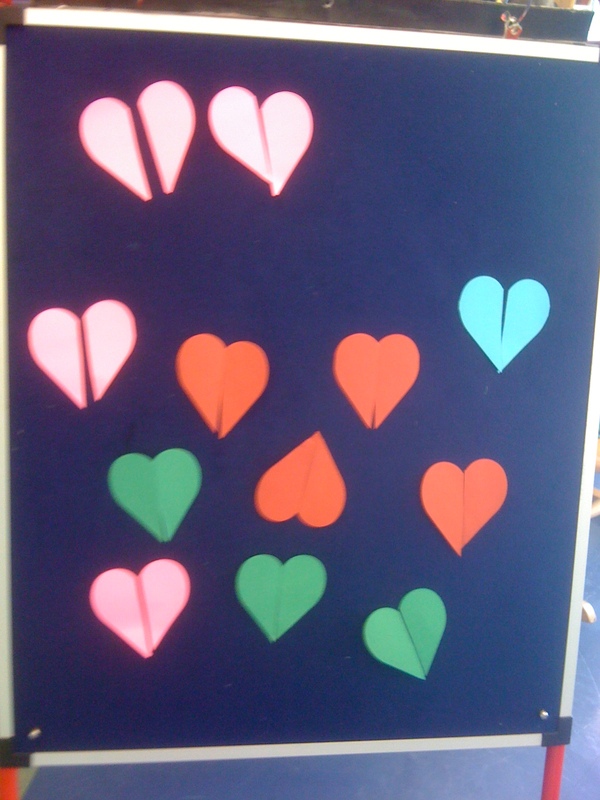 I pre-folded paper and cut out lots of hearts for them to use. Everyone had a great time. Since Halloween is this week it seemed silly not to get into the spirit and have Halloween storytime! 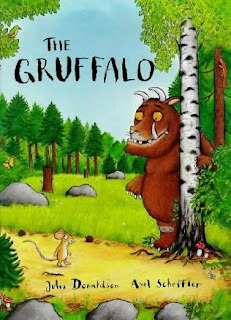 The first book we read was The Gruffalo by Julia Donaldson, illustrated by Axel Scheffler. This is one of my all time favorite storytime books. It’s rhyming text lends itself to be a fantastic read aloud and while it is not specifically about Halloween the Gruffalo is a scary monster who is outwitted by a clever mouse. The kids really enjoyed this story and were eventually able to start predicting the text. 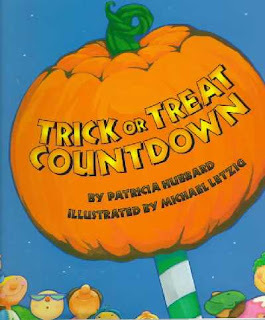 Next we read rick or Treat Countdown by Patrica Hubbard. This counting book is geared for younger kids but I made it a bit more interactive for the older kids by having them help me count and guess which number was to come next. Five year olds love to show off their counting skills and this book provided an excellent opportunity for them to do it! 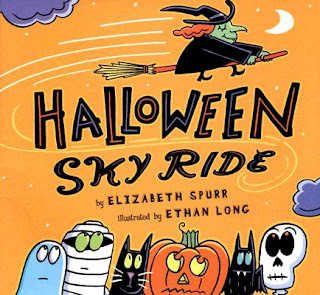 Finally, we finished with Halloween Sky Ride by Elizabeth Spurr. This was a great way to end our Halloween storytime. A witch takes some of her friends for a ride on her broom and go to a Halloween party. This book has a great message about friendship and the kids got a kick out of the story and everyone was very pleased with the end.